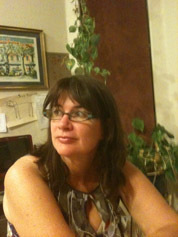 Claudia Keelan is the author of six books of poetry including Refinery (Cleveland State University Poetry Prize), The Secularist (University of Georgia Press), Utopic (Alice James Books), and Missing Her from New Issues Press (2009. Born in California, Keelan has taught in universities in Iowa, Boston, Kentucky, Tennessee, and Colorado. Since 1996, she has been at the University of Nevada, where she is Professor of English and Creative at the University of Nevada, Las Vegas and affiliate to the Black Mountain Institute, as well as editor of the literary journal Interim (www.interimmag.org.) Her honors include the Jerome Shestack prize from The American Poetry Review, the Beatrice Hawley award from Alice James Books, a Creative Achievement award from UNLV, a Silver Pen award from the Library Board of Nevada, and grants from the Kentucky Foundation for Women and the Helene Wurlitzer Foundation. Under the auspices of Interim, she is partner to www.lyrikline.org, an online poetry archive founded in Berlin, whose mission is to serve poetry through translation.